Your ticket to incredible water beading! The McKee's 37 Hydro Blue Essentials Kit has everything you need to prep your vehicle for treatment with the included McKee's 37 Hydro Blue formula. Optimum water beading starts with a smooth, clean surface, and this kit helps you get there! Remove contaminants with McKee's 37 Xtreme Iron Remover, wash without causing swirls using the McKee's 37 Wash Bucket Combo and Xtreme Foam Formula, then coat the vehicle with McKee's 37 Hydro Blue Sio2 Coating and wait for the next rain storm! The McKee's 37 Hydro Blue Essentials Kit takes any guesswork out of choosing the best combination of products, allowing you to get the job done and start reaping the benefits much faster! The McKee's 37 5 Gallon Wash Bucket Combo includes 3 essential accessories that every person needs to wash their car. This money-saving combo includes our rugged 5-gallon wash bucket that’s guaranteed not to crack after countless uses, the revolutionary Grit Guard Insert, and the award-winning Gamma Seal Lid. Just add your favorite McKee's 37 shampoo and you’ll be equipped to make your car clean and shiny! McKee’s 37 Sio2 Auto Wash was formulated for the unique cleaning requirements of vehicles that are coated with a paint, wheel, or glass coating. This thick, luxurious shampoo creates mountains of foamy suds that encapsulate dirt and grit particles, leaving behind an extremely glossy finish! You can confidently use McKee’s 37 Sio2 Auto Wash in direct sun because this pH-balanced, non-alkaline shampoo contains water-softeners that reduce spotting. Works equally well on non-coated vehicles as a gloss-enhancing auto wash. Your vehicle has never looked this good after a simple wash! McKee's 37 Xtreme Iron Remover is pH-balanced and 100% acid-free, so you can use it on every exterior surface with confidence. Simply spray this powerful cleaner directly onto all exterior surfaces and wait a few minutes for it to turn red as it dissolves ferrous (iron containing) particles, leaving your paint glossy, smooth, and bright. Then, wash your vehicle as you normally would and then apply a coat of your favorite wax or sealant. Your vehicle’s paint will appear glossier than it ever has! What if we told you that coating your vehicle with protection that lasts 3 months or longer was as simple as spraying on and rinsing off with a hose? McKee's 37 Hydro Blue does exactly that. This highly-advanced Sio2 coating is applied exactly as described above; waxing your car has never been this easy. McKee's 37 Hydro Blue can be used as a stand-alone form of paint protection, or as a booster for your favorite paint, glass, or wheel coating. 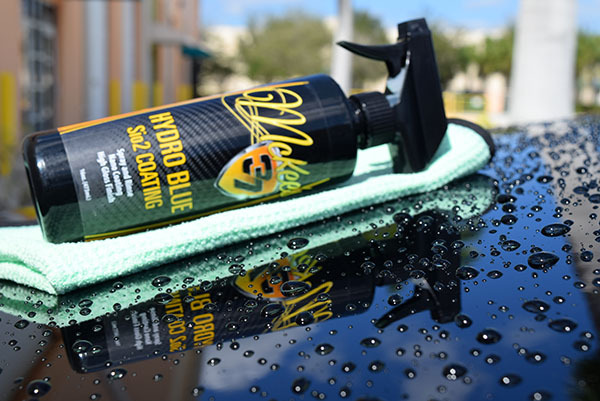 That’s right: McKee's 37 Hydro Blue is 100% safe for ALL exterior surfaces. The Blue Chenille Wash Mitt features hundreds of luxurious chenille fingers to make washing your vehicle safer than ever before. Each “finger” holds tons of soapy wash solution, providing ample lubrication as you swipe over the surface of your vehicle. Since the chenille strands are plenty long, they pull any dirt and grime away from paint, diminishing the risk of wash-induced swirl marks. A total retail value of $132.94. Save $52.95!